Are you anxiously waiting to dress on your brother’s big day or want to sparkle your dressing sense with traditional vibes having modern flick? Explore the latest collection of discounted lehenga & ghararas at Savers Pakistan. 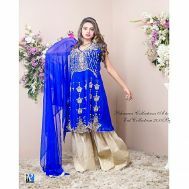 Order from semi-length and full-length embroidered lehengas and ghararas including, blue stone work, brown stone work, 3P green color gharara, 3P peace color gharara, banarsi sareees and embroidered lehenga choli and dupatta suits. Bask in traditional vibes and dress up for the big beautiful days.